Cooking salmon sous vide before giving it a quick sear ensures a flaky, tender texture on the inside and a golden, crispy finish on the outside. Fill the Multi-Function Cooker with 4 quarts (3.8 liters) warm water. Place the Sous Vide Rack in the Multi-Function Cooker. Set the Multi-Function Cooker to Sous Vide Mode and set the temperature to 120°F (49°C). Press Start. In the work bowl of a food processor, combine butter, green onion,garlic, lime zest, and salt. Pulse until smooth. Transfer mixture to a piece of plastic wrap. Shape into a log and wrap in plastic wrap. Freeze until ready to use. 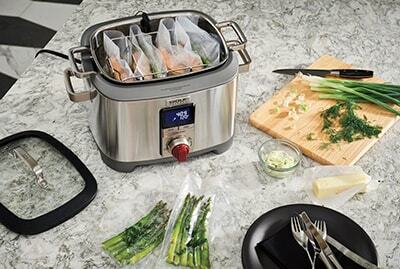 When the water reaches the set temperature, add the salmon and asparagus pouches to the water bath. Cover and press Start. Cook for 20-30 minutes for medium. Adjust temperature if more rare or more well-done is desired for either salmon or asparagus. When finished cooking, remove the pouches from the water bath. Remove asparagus and salmon from the pouches. Discard the water and wipe the Multi-Function Cooker clean. Set the Multi-Function Cooker to Sauté/Sear Mode, HIGH and press Start. Add oil. Pat salmon dry with paper towels. When oil begins to shimmer, add salmon to the Multi-Function Cooker, skin side down. Sear until skin is crispy and browned, 1-2 minutes. Turn salmon, and sear until browned, 1 minute more. Serve salmon and asparagus with remaining lime compound butter.